Golf is not a sport for those who can’t cope with feelings of frustration, anger and sadness. I’ve tried golf. I wasn’t great. But I was a decent soccer player in high school. Recently, at Meriwether National Golf Club in Hillsboro, I played a weird combination of the two. It’s called foot golf, and evidently it’s helping to keep golf courses busy by bringing in an audience that wouldn’t normally visit golf courses at all. NEWS-TIMES PHOTO: CHASE ALLGOOD – News-Times reporter Travis Loose kicks a soccer ball off the second tee at Meriwether National Golf Club’s new foot golf course. The 10-year-old sport is gaining popularity as more clubs have added foot golf courses. The sport began in 2006 and has since spread to courses across the country that have incorporated foot golf holes into the existing traditional golf courses. For foot golf, each player is tasked with kicking a soccer ball into an oversized cup in so many “strokes” per hole. Typically played over 18 holes, foot golf takes less time and is ostensibly simpler than traditional golf. Yet as I kicked the soccer ball eight times to get it to fall into the enlarged par-three putting hole, I started to get the idea that it was a little too much like traditional golf — though it was admittedly more fun. Two days before my outing at Meriwether’s foot golf course, I sat down with Ryan Christensen and Joe Thuillier to get a brief lesson on the 10-year-old sport. 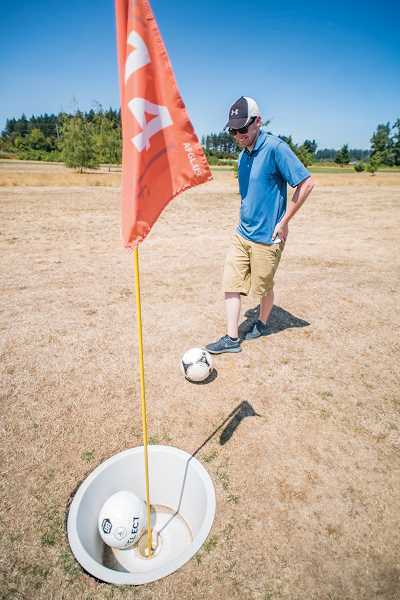 Christensen and Thuillier, Meriwether’s assistant manager and assistant superintendent, respectively, said that they’ve seen the popularity of foot golf increase exponentially in just its few months of being available at the course. Meriwether began offering foot golf in May, but saw only 100 or so rounds played in that first month. In June, that number increased to more than 500 rounds, and July was set to exceed 800. 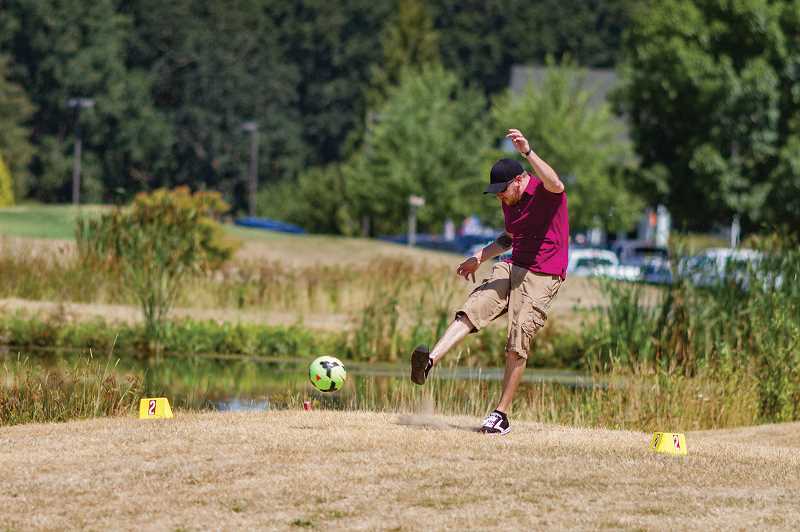 Glendoveer Golf Course in Portland began offering foot golf more than a year ago, “and I thought it was a little gimmicky,” Christensen said. 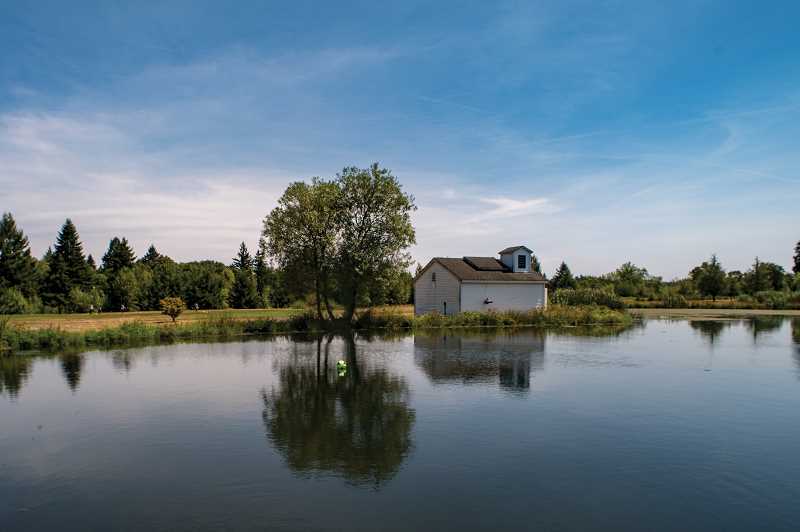 But after hearing success stories during a meeting for the Oregon Golf Club Owner’s Association, he began working with Thuillier to get foot golf up and running in Hillsboro. As I played my turn in the 90-degree afternoon heat, I had no intentions of taking it seriously. My roommate, Kerri, though she claimed to have never been a soccer player, was schooling me. While we flailed and flopped and puttered our soccer balls around the course, we had a surprisingly good time. And after we joined up with another group, it became even more fun. “You just laugh,” Thuillier said. By using the existing 9-hole golf course on Meriwether’s south side, foot golf doesn’t impose on the north side’s 18-hole course that’s mostly frequented by Meriwether’s club members. And though not every foot golf hole plays off the golf holes, it does criss-cross the course quite a bit, which has spurred more than a few complaints from the golf purists. Some of the most vocal have called it a bastardization of the sport, but Christensen and Thuillier said those opinions are the minority. “In reality, they co-exist perfectly,” Christensen said. The most noticeable difference at Meriwether is the changing demographic. “People who would never set foot on a golf course are showing up,” Christensen said. When they built the course, they expected to see mostly young men coming out to play, but “it ends up being families with kids in droves,” Thuillier said. 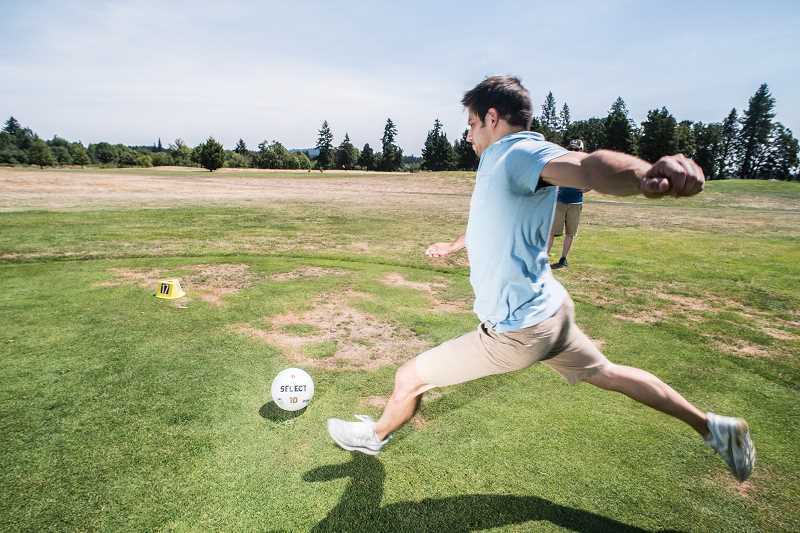 And now, along with the families, local companies like Nike and Intel — and even the Portland Timbers Major League Soccer team — have foot golf team-building exercises. It brought Kerri and me. And it also brought Cory Toews and Chris Escher of Gladstone. Toews and Escher had heard of Meriwether’s foot golf offering from Groupon, the subscription-based coupon service for local businesses. Despite the heat, Escher, the golfer, and Toews, the soccer player, thought it’d be a fun change of pace. NEWS-TIMES PHOTO: CHASE ALLGOOD – Cory Toews kicks a soccer ball off the seventeenth tee. NEWS-TIMES PHOTO: CHASE ALLGOOD – Chris Escher putts a soccer ball into the fourteenth hole. Normally, the two roommates drag each other to actual soccer or golf games, but here they figured the playing field was a little more even. Interestingly, the golfer was winning when we joined them. I just continued to lose. On the last hole, I accidentally kicked my ball into the water hazard where it floated pitifully, bobbing up and down much like my self-esteem had throughout the game. My competitors all had a great time, though. “It’s a lot less strenuous than golf,” Escher said. Toews, who plays in an indoor soccer league in Tualatin — and claimed to have moved from Houston to the Portland area for the rising foot golf offerings — enjoyed how casual the sport was. “I would definitely play again,” Toews said. Weekend: after 2 p.m., unless scheduled in advance. Tuesday and Saturdays after 3 p.m.
Tuesday, Wednesday and Thursday: Open until 2 p.m.
Tuesday, Wednesday, Saturday and Sunday after 4 p.m.
Monday and Thursdays at select times. Thursdays after 3 p.m. and the first weekend of every month, all day.